With global meat consumption projected to double by 2050, reducing your meat intake by 10 to 20 percent can lighten your carbon footprint — and enhance your health. But is eating less meat easier said than done? 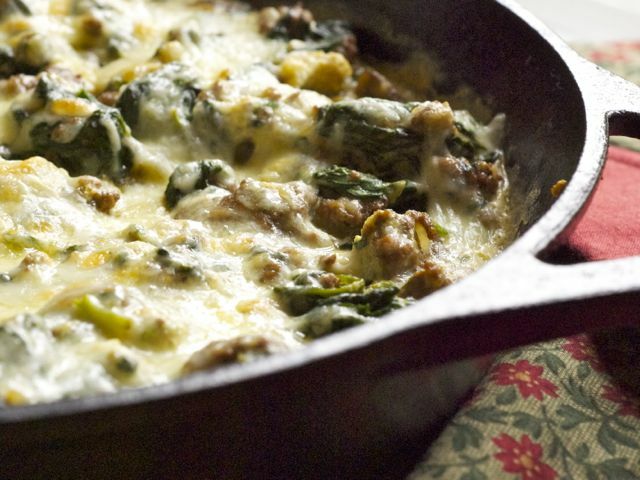 A lot of people take credit for creating this recipe, a winning combination of ground beef, mushrooms, and spinach made famous in San Francisco. The author's version adds a layer of melted Monterey Jack to the mix. Meatless Monday is a well-publicized and practical way to cut down on animal-protein consumption. But routine meat-eating doesn’t have to be an all-or-nothing proposition. And for vegetarians considering putting some artisanal meats, such as grass-fed beef or pasture-raised pork, back into their diets, the abstinence model is no help at all. In a country where dinner is defined by a big protein with two sides, it can be challenging to retool your relationship with meat. Here are eight ways to slash portions, down to two to four ounces per person. The concepts apply to whatever meat source you choose — chicken, beef, pork, lamb, bison — for any meal any day of the week. #(clear n1). Skewer it. Grilled meat on a stick is a worldwide favorite, often in the form of a kebab or satay. Sliced into ribbons or cubed and marinated in anything from teriyaki sauce to garlicky yogurt, a little bit of meat becomes a meal when served over a pile of noodles or rice with ample fresh vegetables. Freezing the meat for 20 minutes makes close cutting easier. Plan on one large meat kebab or two to three sticks of satay per person. #(clear n2). [%image reference-image float='clear right' width=350 caption="Joe's Special."] Stretch it. Depression-era cooks knew how to make a pound of ground meat feed many. Make your mixture roughly three parts meat (ground beef, turkey, pork, lamb, veal, or a combination) to one part breadcrumbs, oatmeal, bulgur, rice, quinoa, or any other cooked grains or even legumes. Add chopped onion and an egg for binding, plus seasonings and spices, for classic meatloaf, exotic meatballs, burgers, or sliders that go far. Joe's Special, which stretches 12 ounces of ground beef to feed four, is another example. #(clear n3). Wrap it. Tacos are the model here, but you can fold minced, cooked meat up in crêpes, roti, rice-paper rolls, tender lettuce leaves, and sheets of nori seaweed, to name a few options. Or make a meat filling to encase in a dough, from pasties and empanadas to samosas and egg rolls. One cup of finely chopped or shredded meat makes six to eight portions to accompany with salsa, chutney, or ginger-soy dipping sauce. #(clear n4). Serve it on the bone. Eating meat off the bone satisfies a primal urge and gives the feeling of satiety with relatively small amounts of meat. Whether it’s pork ribs, chicken wings, or flanken-style short ribs, meat on the bone makes a substantial meal when served with hearty sides of coleslaw and baked beans, steamed rice and vegetables, or mounds of mashed potatoes. Cut between the bones of back ribs, spare ribs, or racks to make single-serving portions. #(clear n5). Mince it. Hand-chopped raw or leftover meat is the basis for some of the world’s classic dishes — think fried rice, or corned-beef hash. Combine meat with cooked grains to stuff and bake into eggplant, peppers, cabbage leaves, or acorn squash. The token protein — be it bacon or roast beef — serves as a major flavor boost. Or serve slivers of meat in tiny amounts over a bowl of bibimbap or in a stir-fry. #(clear n6). Stew it. No amount of meat is too small — from a ham hock used to season a pot of beans or legumes to a couple of chicken thighs simmered in coconut milk — to make stew. In a pot chock-full of seasonal vegetables or legumes, the cheapest, toughest cuts (especially those still on the bone) have a lot to offer. And the more ingredients you add, the less meat you need in a belly-filling meal. Shred the cooked meat to disperse it into the stew before serving. #(clear n7). Stuff it. There's no better side dish for roasted meats than stuffing. Rolling the stuffing inside any boneless meat cut not only fancies up the presentation, but bulks up portion sizes considerably. Butterfly larger cuts, such as pork loin or turkey breast, or use a meat mallet or heavy rolling pin to pound flank steak or chicken breasts down to a mere 1/4 inch thick. Season a bread- or grain-based stuffing well before rolling it up inside the meat and securing the roll with toothpicks for oven roasting or grilling. Serve in one-inch-thick slices with extra stuffing on the side and add a gravy, if you like. #(clear n8). Slice it thin. When holidays and other special occasions call for a large roast or thick steaks, you still don’t have to go big on the meat. With a sharp slicing knife, make 1/4-inch-thick slices of ham, for example, and serve it with all the trimmings. Instead of serving a whole steak, plate slices with a generous salad; that single cut will serve three to four. Portion the leftovers in resealable bags for the freezer for a month’s worth of ready-made sandwich fillings. A sandwich may be the most familiar form for protein portion control — so long as you follow the meat-moderate panini approach, not the Carnegie Deli’s. p(bio). A former vegetarian, Lynne Curry spent the past couple of years eating a lot of beef to research her forthcoming cookbook on grass-fed beef, Pure Beef: An Essential Guide to Artisan Meat with Recipes for Every Cut (May 2012). She blogs at Rural Eating.